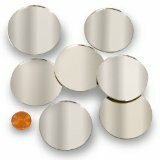 Our beautiful 6 pieces of tiny ROUND beveled mirrors have 1/8" bevel. These economical mirrors are made in Taiwan and made of the highest quality glass (no feet). Each beveled mirror is 3mm thick (1/16") and has polished edges. Sizes of 1", 1.5", 2", 2.5", 3" and 4" will enhance any of your collectible items, craft projects, etc. Ships from Ventura, Ca. within 24 hours. FOR WHOLESALE PRICING OR CUSTOM ORDERS OF ELEGANT BEVELED MIRRORS, call us at 805-650-0166 or email CRYSTALFANTASYINC@YAHOO.COM.